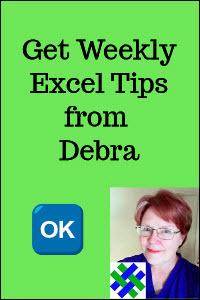 On a worksheet, create a list or orders, and leave the first column blank. 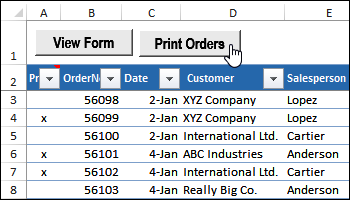 When you are ready to print specific orders, put an X in column A, for those orders. 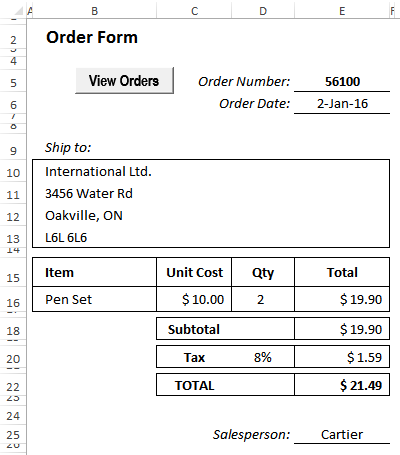 Each order that is marked will be printed, using the template on the Order Form sheet. Change those references to match your order form. After you copy the macro code to your workbook, use the Macro command on the Excel Ribbon's View tab, to run the macro. At first, the macro is set to show a Preview of each order form, and you can change that to a Print command, after testing. The instructions are below. The "X" marks are cleared at the end of the macro, to prepare for the next print session. Also, a message is displayed, to tell you how many orders were printed. and the forms will print, instead of showing a preview. You can copy this code to a regular code module in your workbook, and run the macro when you want to print the marked items. MsgBox lOrders & " orders were printed."